Recently I have been reading the book “Play to Talk” by James MacDonald Ph.D. & Pam Stoika Ph.D. about working with children with language delays. 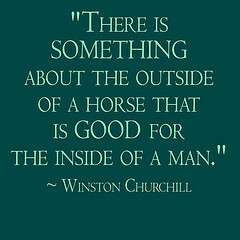 It is so good and a great compliment to what I’ve learned and posted about Speech Disabilities in Therapeutic Riding and Communication Techniques for Low/Nonverbal Riders. Their perspective focuses on the social communication skills side of language development and using responsive communication strategies to engage the child – which is something anyone can do. 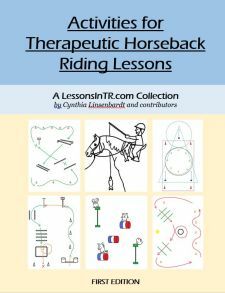 These posts summarize the basic and most helpful concepts relating to the therapeutic riding instructor. In fact, there’s so much I want to share that I’ve divided it into several posts that I’ll be putting up over the next few days, so as not to overwhelm you with too much reading all at once. This first post is some background and the stages of communication, the second one is tips for responsive communications, and the third is about play. I hope you find this helpful for working with your riders with language delays! Disclaimer: I paraphrased everything in my own words, so I hope I remained faithful to the book, but know there may be human error. I highly recommend you read the book yourself, it’s an easy read with big print, pictures, stories and poems – aka it speaks to most learning styles. It is especially interesting if you have a toddler at home who is on his way to talking (aka me). I’m not related or affiliated to this book in any way (other than if you click the link above Amazon gives the blog a little kickback), but this is my own personal recommendation. I bought the book 2 years ago because it got good reviews and finally got around to reading it, and wish I’d done so earlier. According to Play to Talk, when a child has a language delay, two things typically happen. First, traditional speech therapy models use a highly trained speech therapist (SLP, or speech-language pathologist) who focuses on structure, articulation, and forms. This happens in the environment of directive learning, in which the teacher chooses what to teach and controls the interactions. The child receives the therapy primarily with the therapist, less at home with the parents. Second, the parents are unaware of all the pre-talk stages children go through (because most kids go through them so easily and quickly), so they focus on getting the kid to talk-talk-talk long before they have gone through the required pre-talk stages. This causes a lot of stress for both parent and child, as it is impossible for the child to do what they ask. The book Play to Talk offers an alternative called “Communicating Partners,” which is a program that comes alongside traditional therapy models to hit the rest of the bases. First, parents and caregivers do the “therapy” at home in the child’s daily life, where the child typically first learns language anyway, by using the activities that interest and involve them. This happens in a child-directed environment, where you let the child choose the activity and follow suit. Second, it teaches parents to focus on developing the non-verbal communication skills needed prior to talking by engaging the child more frequently in longer interactions, using responsive communication strategies, to guide them through the stages of communicative development from pre-talking to talking to friendship. Play to Talk takes an interesting view in that “communication problems are ultimately interactive problems” – it’s not the language, but the use of language in social life. They point out that parents, “who know little about what children need to do before speech and who are eager for the child to begin talking…often push forward with words, [so] children are taught language without knowing much about communicating. The result is frequently a ‘language performer’ who can recite long passages and answer questions, but who seldom genuinely communicates with others.” I thought this was so interesting. I’m sure this is the case with many children, but I personally don’t think that all language delays fit into this category, because there are some children with physical language impairments that socialize just fine. However, the point is, learning to talk is not just a physical act, but a social one as well! And the communication skills piece, which starts way before one learns to talk, is a huge part of the whole picture that cannot be forgotten. …including you, TR Instructor! This is where you come in. While you cannot do speech therapy unless you are a licensed SLP, anyone can incorporate “responsive communication” strategies that address the social side of learning to talk. What more, therapeutic riding is an ideal environment to incorporate responsive communication: it is part of the rider’s weekly routine, it interests and involves them, and there are plenty opportunities for social interactions and play. you know where the child is developmentally so you can meet them where they’re at and lead them to the next step, instead of expecting too much from them. So that’s some interesting information. The next post will start the actual tips.